Back-to-school time always makes me think of peanut butter and jelly sandwiches -- such an old favorite and so comforting. 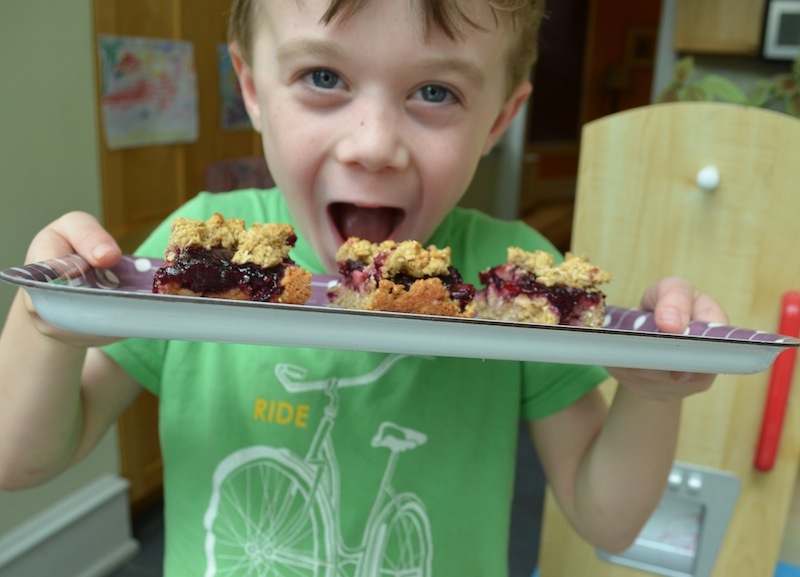 These oat bars take the traditional flavors of a PB & J and turn them into a portable lunchtime or after school snack treat. They're also great for big "kids" who brown bag it in the office too! 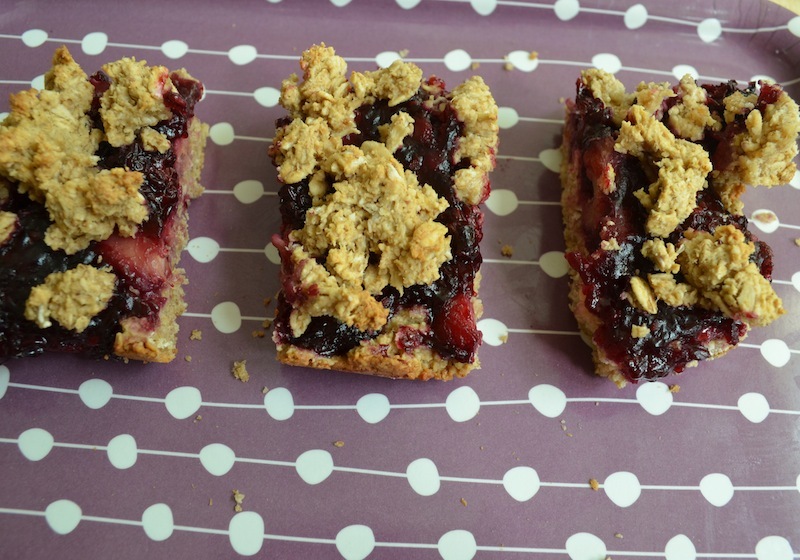 I was inspired by these berry bliss oat squares, which use rolled oats as the base for a flour as well as being incorporated into the dough. If your child's classroom has peanut allergies, you can easily sub in another type of nut butter or go nut-free with sunflower seed butter. You can also use a variety of different berries for the jelly layer. However you change the recipe for your family's needs or likes, these vegan and gluten-free bars are a healthy treat that will keep your family energized throughout the day. 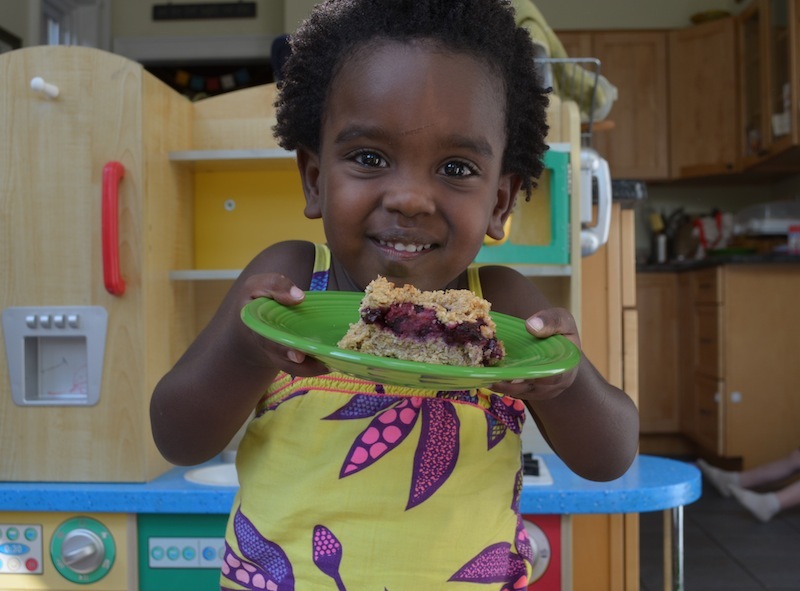 Read on for a yummy, back-to-school or anytime snack! Preheat oven to 375F. Rub the sides of an 8 by 8 inch glass dish with Earth Balance or other vegan margarine. In a small bowl, mix together the potato starch with warm water to form a paste. You will likely want to stir this mixture again just before adding it to the berry layer to make sure it is well-combined. 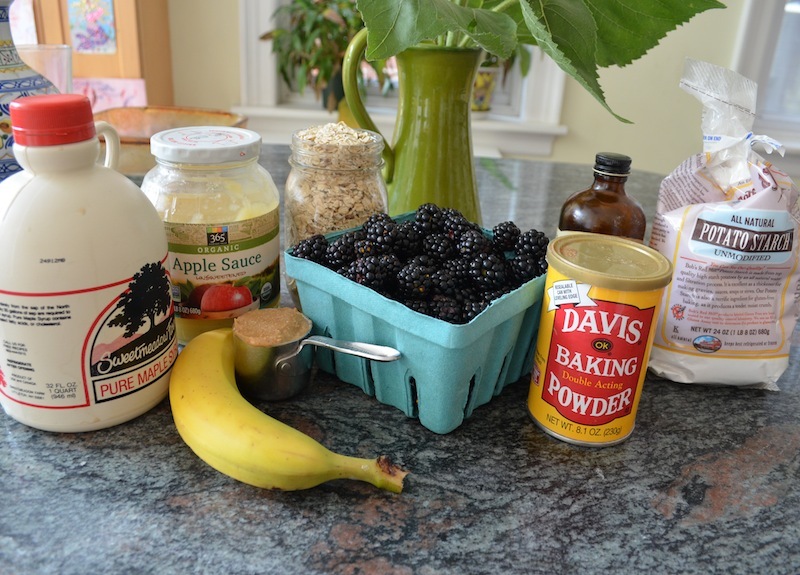 In a small saucepan, combine the berries, banana, and maple syrup. 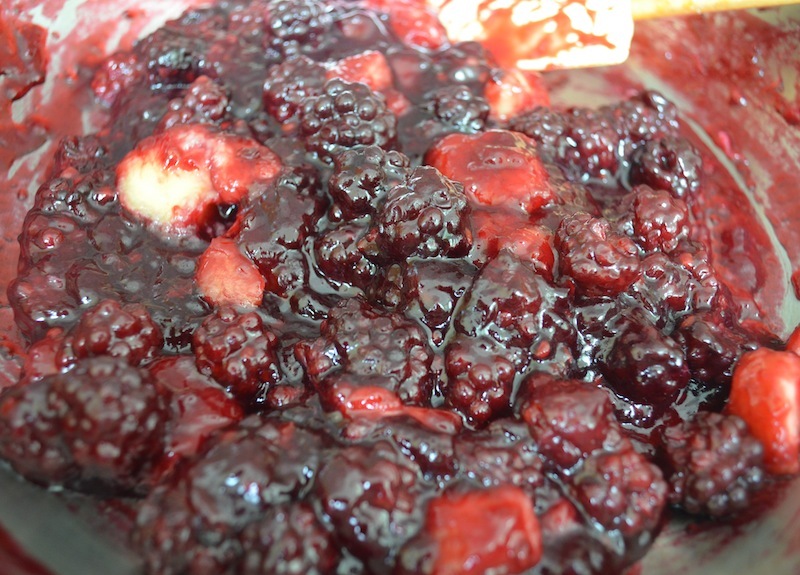 Bring to a boil and let simmer for 4-5 minutes until the berries start to break down a bit and release their juices. Turn off the heat and stir in the potato starch/water combo. This will make the berry mixture more jelly-like. Set aside. 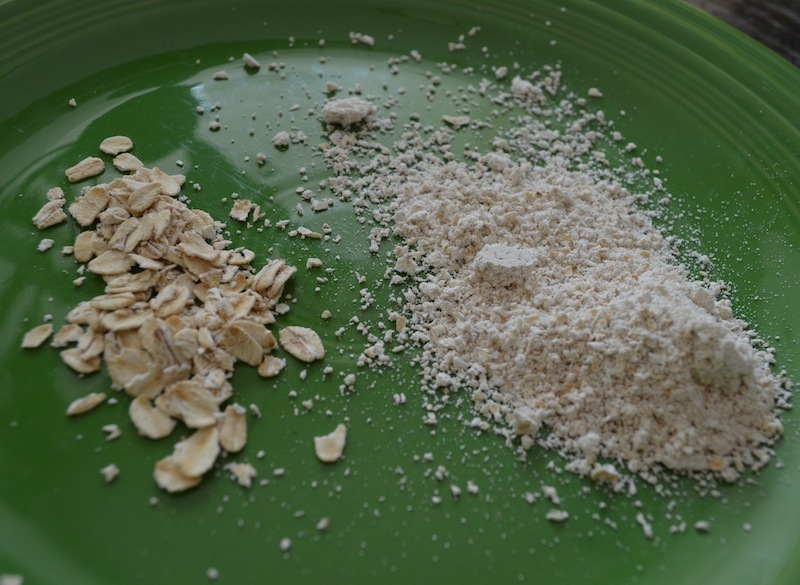 Place 1 1/2 cups of oats into a food processor or high-speed blender and process until a flour forms (I used the dry container of my Vitamix, and this worked really well). Pour the oat flour, remaining 1 1/2 cups of oats, baking powder, cinnamon, and salt into a large bowl and stir together. Add in the applesauce, maple syrup, water, peanut butter, and vanilla and mix well. Scoop 2/3 of the dough into the glass dish and push down with your fingers or a spatula to create a level base. Next, spread the prepared berry filling over the dough, covering it completely. Finally, crumble the rest of the dough over the top. It should cover most, if not all, of the berry layer. …or until the top is slightly golden. Let cool and cut into bars. You can cut these after about half an hour and serve them, but I find they are best (and less messy) when made the night before and then cut. Happy snacking! Preheat oven to 375F. Rub the sides of an 8 by 8 inch glass dish with Earth Balance or other vegan margarine. In a small bowl, mix together the potato starch with warm water to form a paste. You will likely want to stir this mixture again just before adding it to the berry layer to make sure it is well-combined. Next, make the berry layer. In a small saucepan, combine the berries, banana, and maple syrup. Bring to a boil and let simmer for 4-5 minutes until the berries start to break down a bit and release their juices. Turn off the heat and stir in the potato starch/water combo. This will make the berry mixture more jelly-like. Set aside. Next, make the “dough”. Place 1 1/2 cups of oats into a food processor and process until a flour forms (I used the dry container of my Vitamix, and this worked really well). Pour the oat flour, remaining 1 1/2 cups of oats, baking powder, cinnamon, and salt into a large bowl and stir together. Add in the applesauce, maple syrup, water, peanut butter, and vanilla and mix well. Scoop 2/3 of the dough into the glass dish and push down with your fingers or a spatula to create a level base. Next, spread the prepared berry filling over the dough, covering it completely. 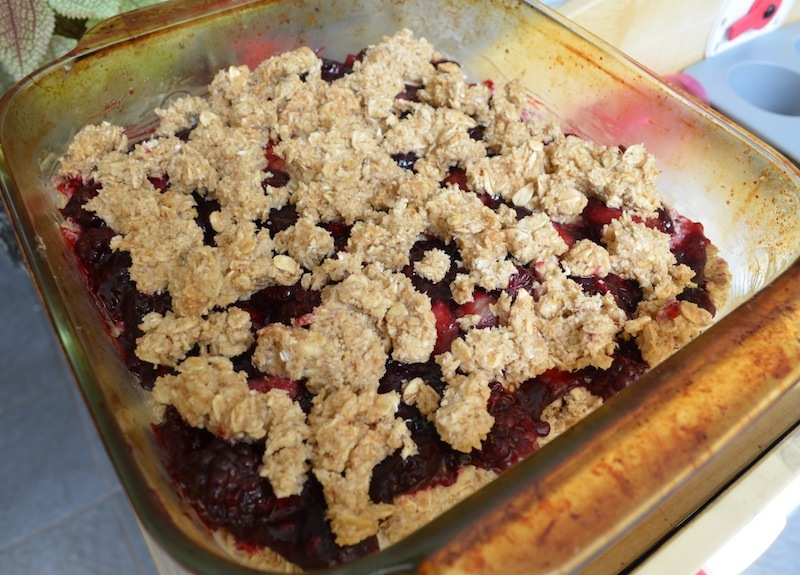 Finally, crumble the rest of the dough over the top. It should cover most, if not all, of the berry layer. Bake for about 25 minutes or until the top is slightly golden. Let cool and cut into bars. You can cut these after about half an hour and serve them, but I find they are best (and less messy) when made the night before and then cut. Happy snacking! 1. Gather the ingredients. Preheat oven to 375F. Rub the sides of an 8 by 8 inch glass dish with Earth Balance or other vegan margarine. In a small bowl, mix together the potato starch with warm water to form a paste. You will likely want to stir this mixture again just before adding it to the berry layer to make sure it is well-combined. ...or until the top is slightly golden. Let cool and cut into bars. You can cut these after about half an hour and serve them, but I find they are best (and less messy) when made the night before and then cut. Happy snacking! 2 cups fresh berries (I used blackberries because that was what was at the farmer's market, but you can mix and match and use 1 cup of one type of berry and 1 cup of another) 1 ripe banana, chopped 1/4 cup pure maple syrup 2 tbsp potato starch mixed with 2 tbsp warm water 3 cups gluten-free rolled oats, divided 1 tsp ground cinnamon 1 & 1/2 tsp baking powder 1/2 tsp salt 1/4 cup + 1 Tbsp unsweetened applesauce 1/4 cup maple syrup 1/4 cup water 1/4 cup + 1 Tbsp creamy peanut butter 1 tsp vanilla extract Preheat oven to 375F. Rub the sides of an 8 by 8 inch glass dish with Earth Balance or other vegan margarine. In a small bowl, mix together the potato starch with warm water to form a paste. You will likely want to stir this mixture again just before adding it to the berry layer to make sure it is well-combined. Next, make the berry layer. In a small saucepan, combine the berries, banana, and maple syrup. Bring to a boil and let simmer for 4-5 minutes until the berries start to break down a bit and release their juices. Turn off the heat and stir in the potato starch/water combo. This will make the berry mixture more jelly-like. Set aside. Next, make the "dough". Place 1 1/2 cups of oats into a food processor and process until a flour forms (I used the dry container of my Vitamix, and this worked really well). Pour the oat flour, remaining 1 1/2 cups of oats, baking powder, cinnamon, and salt into a large bowl and stir together. Add in the applesauce, maple syrup, water, peanut butter, and vanilla and mix well. Scoop 2/3 of the dough into the glass dish and push down with your fingers or a spatula to create a level base. Next, spread the prepared berry filling over the dough, covering it completely. Finally, crumble the rest of the dough over the top. It should cover most, if not all, of the berry layer. Bake for about 25 minutes or until the top is slightly golden. Let cool and cut into bars. You can cut these after about half an hour and serve them, but I find they are best (and less messy) when made the night before and then cut. Happy snacking!